RT:Japanese officials have admitted a leak at Fukushima has been happening for two years and is worse than earlier thought. Why did it take so long to evaluate the actual repercussions of the tragedy and take decisive measures to tackle them? RT:Why the plant's operator failed to contain the leak? Prof. Christopher Busby, to the contrary, believes that "the Pacific Ocean is big enough for this level of release not to represent the global catastrophe that some are predicting" and provides his calculations in his article on RT.com. RT:An estimated 300 tonnes of contaminated water is spilling daily into the ocean. How come Tepco insists the leaks still pose no big threat to the environment? HW: They are lying; they can’t face the reality of this situation. When have very serious quantities of radiation going into the Pacific Ocean. There is no medical or epidemiological or scientific basis for estimating how much damage this will cost. We are on entirely new ground here and this cannot go by without a serious impact on the entire human race. This is a terrible tragedy. 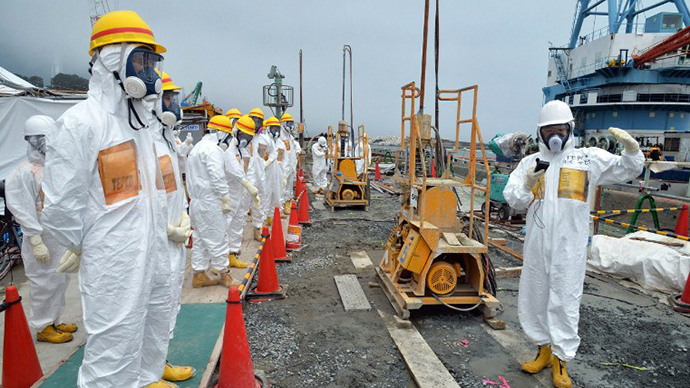 RT:The clean-up was previously on Tepco alone. Why didn't the government step in earlier? Rectifying an accident like the one at Fukushima needs a comprehensive approach, doesn't it? HW: The problem is that the company does not want to admit how serious this is and the government of Japan doesn’t want to admit how serious this is. And even if the government of Japan steps in, they don’t know what to do. This particular administration in Japan wants to open the other nuclear plants. 50 nuclear plants have been shut in Japan since the accident and they want to reopen them. This is very political, because if they admit to how bad the things are in Fukushima the public is not going to stand for them re opening other nuclear plants, including some that are owned by Tokyo Electric Power. How do you have a huge utility company on one hand saying that we can’t control all these 300 tons of radioactive liquid going into the Pacific Ocean every day, and on the other hand we want you to let us open these other nuclear reactors? This is a catastrophe for them and that’s why they have been lying about it because they want to open other nuclear plants but they don’t want the public to know how serious the damage is in Fukushima. RT:According to some estimates it will take 40 years to clean-up the contaminated area. Why so long? RT:What long-term impact of the radiation leak on Japan and its neighbouring countries we should expect in the future? HW: There are serious health impacts. People will be harmed. We are seeing 40% rate of thyroid damage among children in the area and this is a huge impact and it will go up, not down. More and more radiation is escaping from the water and tritium into the atmosphere. And radiation to the thyroid is very serious, especially among small children and we are already seeing a 40% rate. People will be suffering for hundreds of years. I interviewed people in central Pennsylvania a year after the accident and discovered tremendous health impacts among the people there. We know that Chernobyl did tremendous damage to people in Belarus and Ukraine and now we are going to see it again in Fukushima.